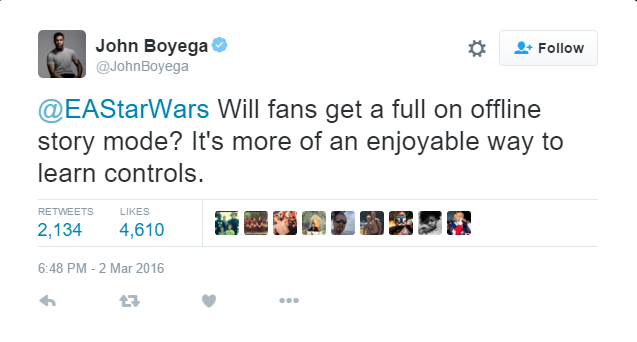 Actor John Boyega recently chatted with EA about one of Battlefront's biggest shortcomings. Earlier this week, DICE and Electronic Arts unveiled the Outer Rim DLC, the first of several planned expansions to Star Wars: Battlefront. And while that expansion will help to build on the game's arguably scant content, it will do nothing to rectify what many regard as one of the game's biggest problems: it's lack of a substantial single-player game. Outside of a few solo missions, the game offers next to nothing for those less inclined to partake in its larger multiplayer battles. 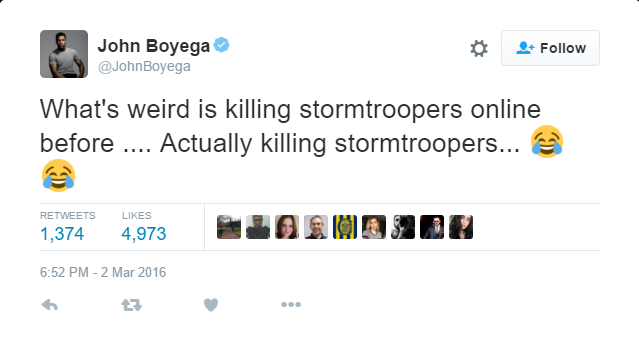 It's a problem that was recently raised by Star Wars-actor John Boyega himself. 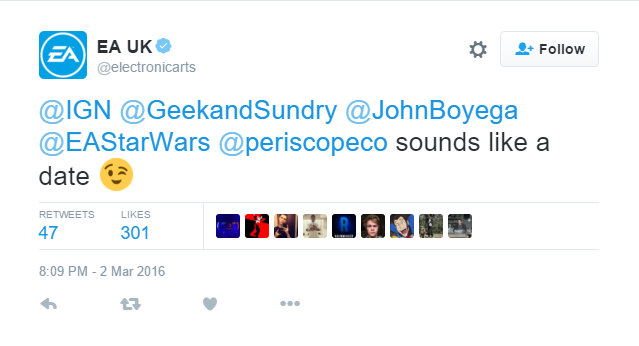 Tweeting to EA's official Star Wars Twitter account, Boyega queried the publisher about the prospects of Battlefront receiving any sort of dedicated single-player campaign. "Will fans get a full on offline story mode?" He asked. "It's more of an enjoyable way to learn controls." EA was quick to write back, asking the actor if he'd "had a chance to try the Missions?" After several more Tweets, Boyega would reply that he thought the missions were "great" but that they "definitely [leave] you wanting to engage within a narrative." 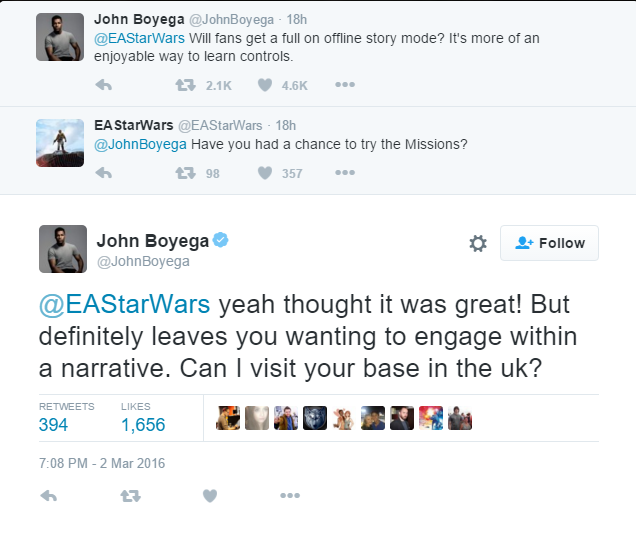 After this Boyega asked if he could visit the company's "base in the UK" to which EA's UK Twitter account promptly replied with a friendly yes. So what's this all add up to in the grand narrative of Battlefront? Sadly, probably not that much. EA and DICE have made it pretty clear that they intend to focus on the game's multiplayer experience. That said, if you're among those who wish the game had a bit more, you can at least know that you're in good company.